When you own a high-standard headphone earphone or a professional sound system, the last thing you need to consider is to download a high-standard audio music to match with your elaborate equipments perfectly. Say, maybe WAV is not new for the music enthusiasts. WAV is a lossless audio format and has the same audio quality as CD's. Therefore, most users like to start with WAV download process, and then store the WAV files in PC to enjoy this lossless audio music at home or transfer to portable devices for playback during traveling. It is a totally free and clean WAV downloader which supports for any WAV downloading mission and can playing WAV files with extremely high quality. As an all-in-one WAV download media player, it's also capable of converting WAV to MP3 and AAC for playback on iPhone, iPad, iPod and so on. Except for WAV audio music, some radio station and organization use WAV format as their audio formats like BBC, UK commercial radio and the Digital Radio Mondiale consortium. Thus it can be seen that it's extremely necessary to have a top WAV downloader which means a lot for WAV download quality. 5KPlayer can meet the high requirement. 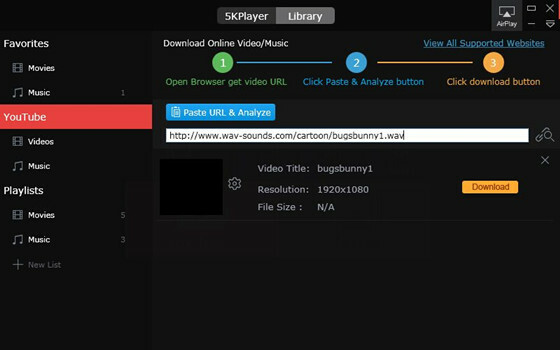 5KPlayer, a multi-functional WAV downloader, ensuring the losslessly WAV download quality and the super-fast downloading speed. Additionally, this WAV file downloader supports batch download function which can save your time at great extent. Luckily, this WAV download is also a perfect WAV player, so you are free to enjoy your WAV audio music freely and don't need to install other codec or player. Moreover, we all know that Apple products are not support for playing WAV files directly, this WAV downloader has another advantage, that is, can download WAV from YouTube to MP3, AAC. Once you sync it, you are free to enjoy high quality audio music in iPhone, iPad, iPod or other portable devices easily. How to Use This Free WAV Download Media Player to Download WAV Files? Step 1: Free download this WAV downloader and launch it. Then click "YouTube" button on the main UI. Plus, this WAV media freeware is 100% clean, no malware, no spyware, no virus, no plug-ins. Step 2: Next, copy the entire URL of WAV audio music you want to download correctly and paste it to the box. Step 3: Tap "Download" button to start downloading WAV. Tip: If you want to convert downloaded WAV audio to MP3 or AAC format, just click "Convert to MP3" and the whole task will be done in a few seconds. About WAV: The standard WAV audio format and CD audio are both sampled 44,100 times per second with 16 bits per sample. As a lossless audio format developed by Microsoft & IBM, WAV can be decoding by player and system directly. Generally speaking, the WAV files are divided into 8-bit data, 16-bit data and 24-bit data. This free and clean WAV downloader caters to your WAV downloading and WAV playing needs, and it's also free to play 1080P HD SD UHD 8K 4K videos so you don't even have to install another media downloader or player. Better still, it's also works as YouTube video downloader to download UHD 5K 8K HD SD videos quickly and losslessly. And this remarkable WAV downloader is also a free AirPlay sender and receiver and a free online internet radio player.